Sieglinde's research interests center around agroecology, particularly integrated approaches to soil and crop management for sustainable production. Sieglinde is committed to linking on-station research experimentation to participatory approaches, working with interdisciplinary teams in the Great Lakes Region of USA, and beyond. Scholarship, extension and farmer engagement that involves participation of multiple stakeholders is central to her extension approach. 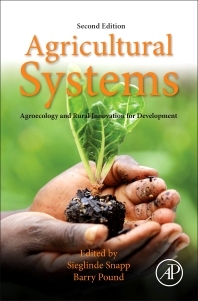 Dr. Barry Pound started as an agronomist and has steadily widened his experience through farming-systems approaches to sustainable-livelihood development and agricultural innovation systems. His interests include bridging the interfaces between social and natural sciences, and between research and extension. Currently, Dr. Pound is a visitng fellow in Livelihoods and Rural Innovation, Livelihoods and Institutions Department Natural Resource Institute, University of Greenwich Kent, UK.